Events to check out this weekend, July 12 to 15. 1. Hey ladies! Get funky. This week kicks off this summer’s Movies With a View series at Brooklyn Bridge Park, where the drama happens both onscreen and in the skyline backdrop. This year’s lineup focuses on female-directed films, accompanied by talks by women and a SHE DJs series. Tonight, see Susan Seidelman’s Desperately Seeking Susan (starring Rosanna Arquette and Madonna), with a talk by Deputy Mayor Alicia Glen and DJ Isis Swaby. This week is the Brooklyn Hip-Hop Festival, which, 14 years in, shows no signs of slowing down. Check out the sneaker exhibit, dance battles, DJ showcases, and more, or buy a ticket for the daylong homecoming concert on Saturday at Brooklyn Bridge Park, headlined by Black Star, with Pharoahe Monch and DJ Boogie Blind, Skyzoo, Caleborate, LATASHA, Radamiz, Mobetta & Soul’d U Out, Milo Case, and Mister Cee. In other hip-hop happenings, Philly’s rising talent Tierra Whack plays a late set tonight at Baby’s All Right, before going on to open for Lauryn Hill in Philadelphia. 3. … Or catch your beats by the beach. Speaking of Ms. Lauryn Hill, it’s the 20th anniversary of the game-changing The Miseducation of Lauryn Hill. You can catch her on Sunday celebrating at the Northwell Health at Jones Beach Theater, with openers M.I.A., Busta Rhymes, and Jo Mersa Marley. Come early and catch some waves and rays before the show. Come extra early (read: Saturday) and see the Foo Fighters in the same venue. 4. See a new take on an old play. Jack. Brooklyn reimagines the 1978 Wallace Shawn classic Marie and Bruce, a comedy about a festering marriage starring Gordon Landenberger and trans actress Theda Hammel, who also double as the set and sound designers. With producers including comedian and actor John Early and directed by Knud Adams, it’s sure to be a hilarious and surreal time. Performances begin today and run through July 28. 5. Or guess which famous person inspired this very modern production. Idina Menzel stars in the Roundabout Theatre Company’s Skintight as a neurotic, recently separated lawyer who corrals the family into visiting her fashion-designer father ostensibly to celebrate his 70th birthday. When she arrives, she finds him with a much younger boyfriend, who is coincidentally the same age as her son. Drama! Reuniting writer Joshua Harmon and director Daniel Aukin (the team behind Bad Jews and Admissions), the sharply funny work examines just how much we prize beauty and youth. 6. Get a cocktail out of a vending machine. This week saw the opening of Existing Conditions, the new cocktail spot by the dream team of Dave Arnold (Booker and Dax), Don Lee (formerly of PDT and Ssäm Bar), and Greg Boehm (founder of Cocktail Kingdom), who love science as much as they love drinking. Well, maybe not as much. Have a soft drink meant to taste hard, have a cocktail with carbonated honey, or maybe one with waffle-infused bourbon that could double for breakfast. You may not be able to get out of town, but at least your taste buds will go on an adventure. Didn’t get those Radiohead at MSG tickets? No worries, there are no tickets required for this weekend’s batch of free shows, starting with Toshi Reagon at Battery Park and Antibalas at BRIC Celebrate Brooklyn! tonight, and Suicidal Tendencies at the House of Vans and Kronos Quartet at BRIC Celebrate Brooklyn! on Saturday, along with the Dirty Projectors at Rough Trade. 8. Toast to the French. What a weekend for Francophiles. This Saturday is Bastille Day, celebrating the birth of the modern French nation. Don your beret and stop by Le Coq Rico for $10 “Frenchie” wine-based cocktails between 12 p.m. and 8 p.m., like the Harry Rico with passion fruit and thyme. The Citroen & Velosolex Club will also bring vintage French cars to the restaurant outside at noon for photo ops. Bar Boulud beckons passersby with can-can dancers and live music on their outside terrace from noon to 8 p.m., along with stations selling crêpes, Choux à la Crème (profiteroles with classic vanilla Chantilly) and wines. And the annual Bastille Day fair of food, entertainment, and culture on 60th Street actually takes place on Sunday this year, but all the better to cheer on France (if that’s your thing) when they take on Croatia in the World Cup final at 11 a.m. There will be two screening locations along the route, from Fifth Avenue to Lexington Avenue. 9. Watch electric cars go zoom. This Saturday and Sunday, the electric car Formula E street race happens in Red Hook, where drivers will race along the waterfront in a doubleheader season finale. All you have to do is get yourself a ticket. 10. 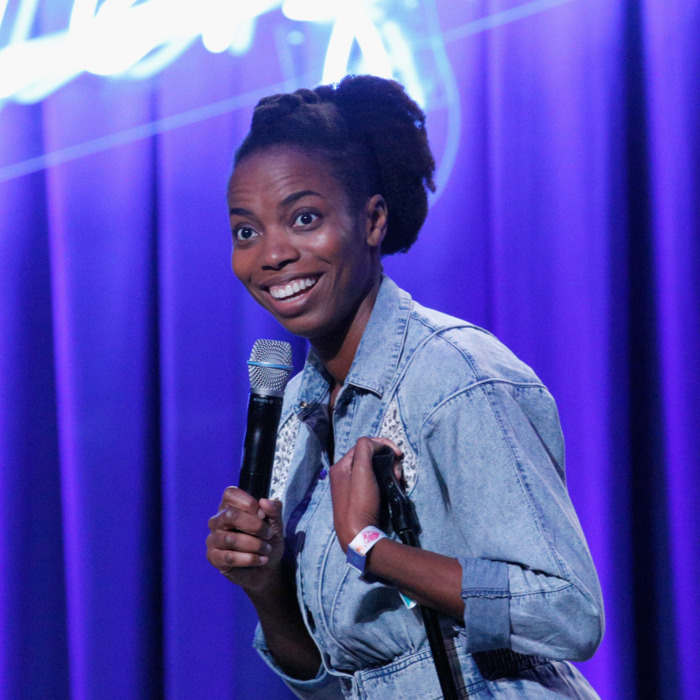 Say good-bye to Sasheer Zamata. The SNL alum is doing one last Sasheer Zamata Party Time! variety show before she moves to L.A. to pursue big dreams. Show up on Sunday at the Bell House to cry real tears and for a lineup of Wyatt Cenac, Liza Treyger, Emmy Blotnick, Anya Marina, DJ Zephyr Ann, and free snacks.